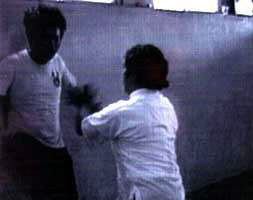 In 1992, Don Miller described in Tai Chi Magazine his T’ai Chi Ch’uan experience with master Chern Chyu Kuan in Taiwan. Don and Sam Edwards who have trained with master Chern have subsequently begun teaching his Vertical Axis Tai Chi Ch’uan in the United States. In l996 & l997, a senior instructor from Chern’s Rur Yur (pronounced “Roo Eee”) Tai Chi training Center in Taiwan visited these U.S. schools and conducted workshops. Kyle Yu is an American with previous martial arts experience who has lived in Chia-Yi city for the past four years and studied daily with master Chern. Master Chern’s unique Vertical Axis style is a modification of Cheng Man-Ch’ing’s development of the classic Yang style T’ai Chi Ch’uan. 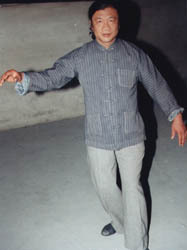 Cheng Man-Ch’ing elevated the traditional low stances of the yang style, simplified many of the movements, and emphasized momentum and softness. Chern has raised and shortened the stance even more. All postures are single weighted, and all rotations are made on the Bubbling Well (Kidney 1 acupuncture point) of the weighted foot after the weight shift onto that foot is completed. Emphasis is on the weight being low in the body, not the stance being low, rather than the body being low to the ground, with the upper body very loose and relaxed, the arms seldom rising above chest height. Chern sees the body-erect and stabilized on one leg as an axis, with the other leg devoid of weight — like a spinning planet, the rotation increasing its subtle electromagnetic field, the momentum and centrifugal force “exciting” the ch’i. Chern’s body posture and method of movement ensures greater relaxation and responsiveness in the body as well as developing a stronger connection between the weighted foot and the ground. With the addition of the easier rotation about the single vertical axis of the weighted leg and the spine, practitioners quickly acquire a dynamic “root” that generally takes many years to develop in other T’ai Chi Ch’uan systems. A unique moving step Push Hands arises naturally from the system, based on Chern’s analogy of a spinning globe. The relaxed ability to rotate on the axis of the weighted foot promotes a natural, unstudied response to a partner that does not depend on trained technique. Push Hands can therefore be taught to students from the very beginning of their training as simply an extension and complement of the form. Relaxation and body conditioning are promoted with chi kung exercises that, like Master Chern’s other practices, emphasize simplicity and fundamental principles. In the U.S. workshops, Kyle Yu stressed that the basics of the system are both its foundation and its ultimate, most sophisticated aim. Gently falling backward against a wall, meditative walking, and a bear posture chi kung constitute the core of the energetic practice that Master Chern directed Kyle to encourage in the U.S. outposts of Vertical Axis T’ai Chi Ch’uan. Falling against the wall is one of the core practices at Chern’s school. Gently falling backyward approximately one foot against a stable wall breaks up stagnant chi and encourages the free circulation of energy by resonance (not impact!) throughout the body. This exercise teaches the student to relax completely, as babies do. You can tap a baby on the foot and feel the resonance throughout its “open” body even in its head. The vibration and resonance also increases the body’s internal substance and density. Allowing the energy of impact to travel freely down the body to the ground increases the student’s connection to the earth, or root. 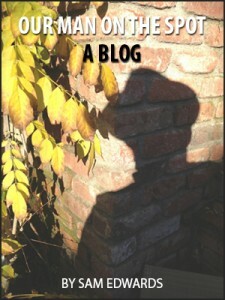 Meditative walking is also deceptively simple. Stand with all the weight on one foot and release as much muscular tension as you can. It is particularly important to release the hip flexor muscle, resulting in a slight fold at the hip. Release the shoulders too, letting them round forward slightly. Release the chest to allow the heart and lungs to relax. Release the buttocks. As you work on releasing unnessary tension in the muscles of the body down to the foot, feel all the weight of the body in the foot. The ideal is to encourage an energetically and physically lower center of gravity. Walking takes on a new meaning when you maintain the feeling of release and relaxation. Shift the weight to the empty foot by gently pushing down on the ground with the weighted foot, maintaining a level pelvis, until you are again single weighted on the leg. As the previously working leg empties of force and weight, there is a sensation of the remaining weight becoming liquid and pouring to the other leg and on into the ground. Bear posture Ch’i Kung adds rotation to the weight shifts involved in the walking exercise. Stand in the same relaxed posture, feet parallel and shoulder width apart, all the weight on the left foot. Turn to the left from the foot to a forty-five degree angle from your forward direction, allowing the arms to swing up at the most a forty-five degree angle from the axis of the body, with the palms facing each other. Without changing the orientation of the body, shift the weight to the right foot by pushing off from the ground with the left foot. Then rotate the body on the weighted foot ninety degrees to the right (forty-five degrees away from the forward direction, but on the right side). Reverse the process and repeat. The rotations of the Bear posture exercise occur after the weight shift, and as Don Miller has written, are motivated by an imagined turning or spiraling on the Bubbling Well of the loaded foot, rather than by a turn of the waist or spine. One of Cheng Man-Ch’ing’s distinctive training practices was to hold the postures of the T’ai Chi form as static Ch’i Kung exercises. Students holding postures with Master Chern’s more upright posture and with greater relaxation in the arms and upper body find increased circulation of energy to the upper body. The history of Chern’s Vertical Axis T’ai Chi in the United States has been short but richly rewarding. In 1990, Don Miller and Sam Edwards were part of the U.S. team competing in the Internationals held in Taiwan that year. The entire U.S. team was invited by Master Chern, coach of the winning Taiwanese team (the U.S. team was a close second), to travel as his guests to Chia-Yi for an informal match with his school (which had provided the majority of the players on Taiwan’s national team). Inspired by those amazing few days, Don and Sam returned the next year with Bruce Shapiro. All three had practiced martial arts for some years. Nevertheless, the notion that you can lower your center to your foot without physically lowering your body was a very difficult adjustment to make-even after experiencing how Master Chern could project any of the three across the room with breathtaking ease, all the while standing erect and totally relaxed. These short visits to Taiwan have already affected Push Hands competition in the United States. Robert Macy, perennial super heavy weight champion, studies Vertical Axis Tai Chi, along with several other arts. Don Miller has won every heavy weight competion he has entered for years. 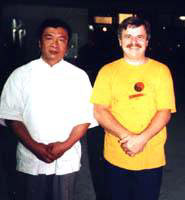 In spring 1996, Kyle first visited Los Angeles, where he demonstrated Master Chern’s continuing innovations for Don Miller, Bruce Shapiro and other experienced martial artists. Next he went to Mendocino, north of San Francisco, as a guest of the Redwood Coast Tai Chi Association and Sierra Nevada Internal Arts , both of which feature Vertical Axis Tai Chi. The Redwood Coast Tai Chi group includes a number of practitioners with over twenty years in various martial arts such a tai chi chuan, pa kua, and choy le fut. All find that Vertical Axis Tai Chi enhances rather than contradicts their other styles. During his visit, Kyle Yu emphasized movement that is completely “let go” — almost in a drunken manner. In the weeks subsequent to Kyle’s visit, many members of the association experienced unlocking of habitual areas of tension patterns, particularly in the shoulders and pelvic girdle. Sam Edwards is past coach to the Redwood Coast T’ai Chi association and is currently coach of the Sierra Nevada Internal Arts association. Frank Broadhead and Al Gillespie are coaches of Redwood Coast.